Friday of the sixth week of Great Lent marks the end of the 40 days of preparatory lent, during which the Church taught us about repentance, inner prayer, the bearing of one’s cross, ascending the ladder of virtues; taught us to supplicate the Mother of God, in order to obtain the most powerful aid in the matter of penitence; and finally, as the supreme example of its teaching, the Church offered us the image of Saint Mary of Egypt, a great sinner, who, by means of penitence, fasting and obedience to the Holy Virgin, attained the angelic state in which man was originally created. Now the Church turns to a direct commemoration of the historic events of almost 2,000 years ago, which were instrumental in achieving the salvation of mankind. The Jewish feast of Passover was approaching, and with it the last days of the Lord Jesus Christ’s life on earth. The rage of the Pharisees and the Jewish elders against Christ was extreme, and they waited for an opportune moment to seize the Lord and put Him to death. In one of the holiday hymns the Lord is called “the conqueror of death.” There have been many conquerors in the history of mankind: talented physicians conquered illness, military leaders conquered huge armies; there are conquerors of space and conquerors of distance. But the world does not know any other “conqueror of death” except Jesus Christ. None of the most prominent men in the world have ever aspired to that title. He alone could do so - our Lord and Saviour. During His life on earth He showed His power in three cases: the resurrection of the daughter of Jairus, the resurrection of the son of the widow from Nain, and the resurrection of Lazarus. 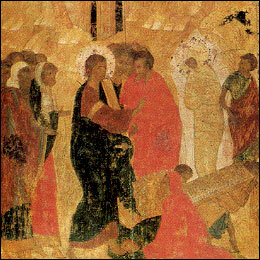 Icon painted by Andrei Rublev in 1405. The death of the daughter of Jairus was a very recent death. She died while Christ and her father were on their way to her. Even Christ called her death “sleep,” but everyone laughed at Him, knowing that she had died. But He sent everyone out and, taking her by the hand, said: “Maiden, arise!” And her spirit returned and she arose. In the case of the son of the widow from Nain, death had taken a stronger hold: the deceased had already been placed on a bier and not only carried out of the house, but was already being carried out of the city gates for burial. The Lord stopped the procession, touched the bier and said: “Young man, I say unto thee - arise!” The dead youth sat up and began talking. And Jesus gave him back to his mother. Then many of the Jews who were there and had seen the incredible miracle, came to believe in Jesus Christ. But others went to the Pharisees and told them of what Jesus had done. Christ’s enemies became worried, and fearing that the entire populace might come to believe in Christ, they convened a council and decided to kill Him. But news of the great miracle spread all over Jerusalem. Many Jews came to the house of Lazarus to see him, and having seen him, believed in Jesus Christ. Then the Jewish elders decided to kill Lazarus, too. But Lazarus lived for a long time after his resurrection, and later served as bishop on the island of Cyprus.